If you live in California, a major earthquake is your worst nightmare. The thought of a 9.5 quake is almost unimaginable and terrifying. Quick, stand under a doorway or hide under a desk, it’s coming and the aftermath is not all that pretty in San Andreas. This adrenaline-pumping movie turns a nightmare into big screen reality as it takes the disaster film genre (The Poseidon Adventure, Towering Inferno, Earthquake, Twister) to a whole new level. A Caltech seismologist, Lawrence Hayes (Paul Giamatti), and his research partner Dr. Kim Park (Will Yun Lee, Hawaii Five-O), have found a way to predict earthquakes. “ Mass destruction. It’s not a matter of if, but when,” says Hayes. A Los Angeles Fire Department and Rescue helicopter pilot, Chief Ray Gaines (Dwayne Johnson), is dealing with the impending divorce from his wife, Emma (Carla Gugino, Spy Kids), and the breakup of his family after the death of his youngest daughter. Gaines’ surviving daughter Blake (Alexandra Daddario) is visiting San Francisco with Emma’s new wealthy, duplicitous boyfriend, Daniel (Ioan Gruffudd, Horrible Bosses). Cue the tremors. The task of weaving the storylines into a viable drama as unfathomable carnage and chaos unfold is up to director Brad Peyton, who worked with Dwayne Johnson and producer Beau Flynn on Journey 2: The Mysterious Island. That film, however, left no indication that Peyton was perfectly capable of unleashing this monster. The moment-by-moment, never-stop-moving, continually astonishing 107 minutes of perfectly edited (Bob Ducsay, Godzilla), amazingly shot (Steve Yedlin, Carrie), well adorned (production designer Barry Chusid, The Day After Tomorrow) footage features 1,300 visual effects: Collapsing city skylines, a tsunami, the destruction of the Hoover Dam, farmland shifting like a deck of cards and bridges snapping like bread sticks. With Peyton at the helm, there is little time to breathe. And the few moments of respite, are reserved for fleshing out the characters and their dynamics. Paul Giamatti and Will Yun Lee don’t overplay their serious roles. Alexandra Daddario as Blake, a fitting young heroine, is believable as the young woman stranded in S.F. looking for higher ground and a rescue. Ioan Gruffudd as the cad who leaves her is suitably deceptive and cowardly; you want to witness his demise. Carla Gugino shows a feistiness that makes her character credibly brave. However, the weight of the film rests on Dwayne Johnson’s shoulders, and brother-man is up to the heavy lifting. His portrayal of Gaines is humorous, vulnerable and courageous, all at the right times. He is a far better actor than most of his movies would reveal. He’s solid. 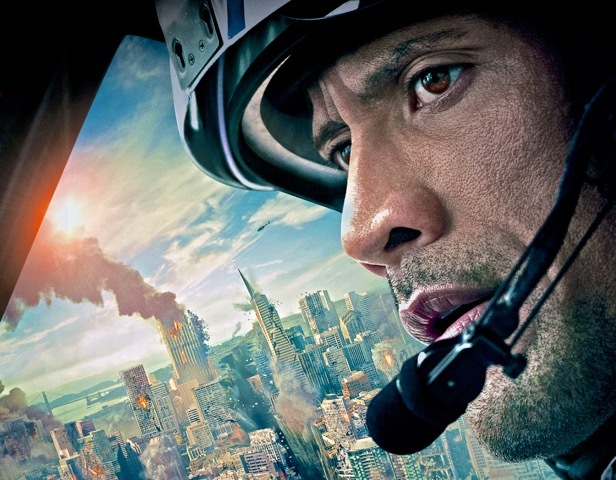 San Andreas starts with an action scene, ends with an action scene, and in-between the pace is almost as relentless as the wave of destruction. It just doesn’t stop.